Today, the satellite industry is in transition. It is working hard to join the broad telecommunications landscape and break through the current barriers that limit mass-market adoption of satellite consumer and enterprise broadband. Innovative concepts and technologies must come together to propel satellite into the major role it could play in our hyper-connected society. The four corners of innovation — Delivery, Capacity, Efficiency and Distribution — must each create enormous price and performance disruption to meet the latent user demand for broadband worldwide. The satellite ground ecosystem must heavily impact distribution. But today’s antennas are not adequately innovative next-generation, high-throughput terminals. A new class of terminals is required for the industry to successfully transition to new markets. This ground technology must dramatically increase user functionality with terminal economics that support mass enterprise and consumer access to satellite broadband. Over 53 percent of the world remains unconnected. Satellite broadband can ensure global access and a new, high-growth period for the satellite industry. 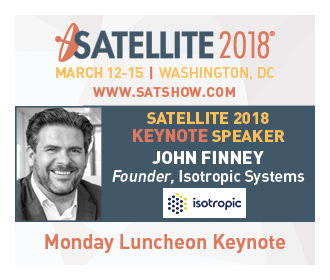 Join us during the Monday Keynote Lunch with John Finney, Founder, Isotropic to experience first-hand the next generation terminal technology that will enable exponential industry growth.